Thick snow coats the valley floor whilst the winds howl at the peaks. Even so, life around the village chugs along in earnest, the first stubborn shoots even breaking their way through amid the bustle. The Tribe has been busy in the shadow of spring, so let’s get right into it. Stonetalon is no stranger to snow, and with it see many an avalanche throughout the winter months. When a group of volunteers went out to clear the latest snowy blockade off of the north east pass, it was thought of as nothing more than a fact of maintenance. That is, until the party realized that there were eyes in the pass. A pair of owls revealed themselves to be not so much white as gold and blue; the hills hiding eyes and arrows all around. After the tense back and forth, it was made apparent that the snowfall had hardly been an accident, and certainly not something the Alliance soldiers wanted tidied away. The group retired from the task, reporting the incident to the Sages. Envoys were dispatched quickly to Windshear Hold, hoping to smooth over the tensions from days prior and reaffirm Stonewind’s status as neutral territory. The Commander, a night elf, gave them his assurances, further offering that the pass was now cleared and open to all once again. The envoys left with gratitude, and a creeping feeling that there was more to the story than they were being told. Uneasy with the state of the affairs, Pathfinder Talaweha rallied volunteers from Stonewind to go seek out those most impacted by the war. Setting the kodo horns for north, the group set off for Ashenvale, the smoke that billowed down the coastline still fresh in the mind of many. Under the shadow of the canopy, the Expedition stopped to rest and get its bearings. It was here that they encountered their first denizen of the land, a lone hunter looking to fill his waterskin. Suspicious of the hoofed band, the elf quickly made himself scarce. The group, looking to make camp before nightfall, followed shortly after him, a path well-used seeming as good a route to go as any. It was just as well they did. As the evening drew on, just as they were settling camp, the sound of fighting could be heard. The group went to investigate, finding the same hunter outnumbered against a pair of eight-legged quarry. After lending their assistant, the wary elf seemed marginally more inclined to engage with the band, explaining his role in a small hunting group that had run into trouble. With some convincing, the elf agreed to have the Expedition accompany him to find his group once daylight came. What they may find remains to be seen. 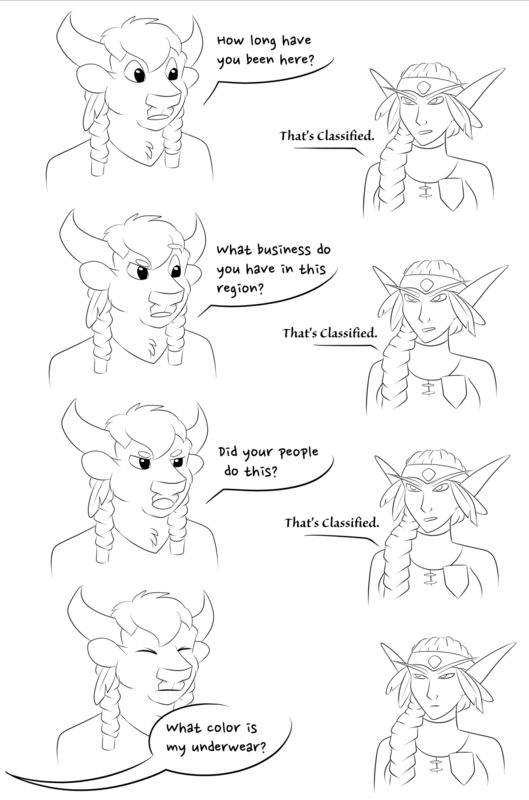 Stonewind diplomacy at its finest. While the pass is again open, please take extra caution while traveling along the north east trails of Stonewind land. These are complicated times. If you find your laundry frozen, please take it into your tent to thaw. Elemental-based solutions to frosty undergarments is strongly advised against. Kaeva Bloodhoof has earned the rank of Warbrave. She is to be the right hand of the Totemguard, training new recruits and managing Brave duties when Eyonita cannot (or is having a nap, either or). Harutho Oxenhead has earned the rank of Brave, and has accepted the responsibilities it entails. Let’s hear it for the resident cinnamon bun! Grimandr Kindlehorn has earned the rank of Brave, and has accepted the responsibilities it entails. A big congratulations to the soft-spoken Sunwalker! Any questions about guild Advancement should be brought to Balkaria (Ravens), Talaweha (Hunters), or Eyonita (Braves). If you ever have ANY issues or concerns, especially within the guild, PLEASE reach out to one of the officers! Seriously, if you are feeling at all uncomfortable with anything going on, go to the officer you feel most comfortable interacting with and give your voice. We want everyone to feel welcome here. Speak up and we'll do our best! Winds be at your back!